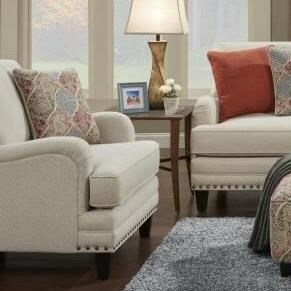 Warm earth tones and sophisticated design details make this chair a welcoming spot in your living room. Set apart by the transitional style of its English rolled arms with gathered fabric and nail heads along the front rail, the chair is also comfortable with a loose T-style back cushion and seat cushion, plus a 20-inch square accent pillow. The 5960 Transitional Chair with English Rolled Arms by Fusion Furniture at Royal Furniture in the Memphis, Nashville, Jackson, Birmingham area. Product availability may vary. Contact us for the most current availability on this product. The 5960 collection is a great option if you are looking for Transitional furniture in the Memphis, Nashville, Jackson, Birmingham area. Browse other items in the 5960 collection from Royal Furniture in the Memphis, Nashville, Jackson, Birmingham area.